Creating letters the old-fashioned way: paper and scissors. On Friday evening, September 14th, AIGA Boston will present the AIGA Fellow Award to design visionary and youth advocate Denise Korn. This gala event will be in two acts: a dynamic awards ceremony featuring the theme “The Work Ahead” at the Huntington Theatre Company’s Calderwood Pavilion at the BCA, followed by a killer dance party at the Boston Ballet. 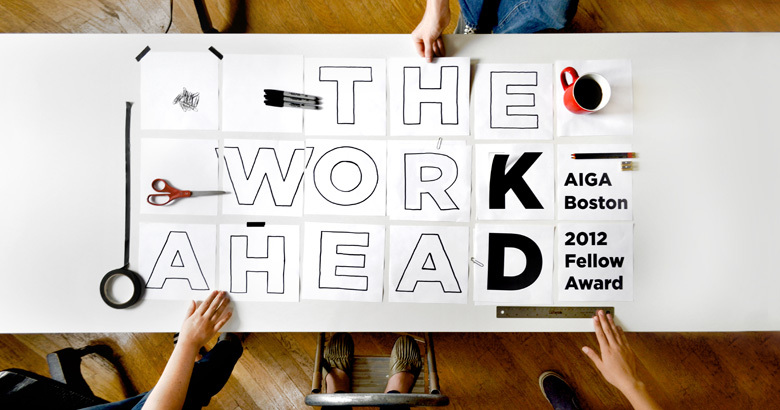 The AIGA Boston Fellow Award recognizes a senior designer who has made a significant contribution to raising the standard of excellence in practice and conduct within the local or regional design community. This year’s recipient, Denise Korn, is principal of Korn Design, and founder of Youth Design, an organization that provides career pathways in design-related industries for talented urban youth. A panel of distinguished speakers will discuss how Denise has challenged, motivated, and supported them in their efforts to do creative, meaningful work in their professional and personal lives. Dancers from the Boston Ballet will stage a special performance in honor of the occasion.